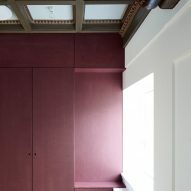 Leth & Gori has transformed a 19th-century chapel in Copenhagen into an activity centre for cancer patients, using a material palette influenced by the building's original painted ceiling. 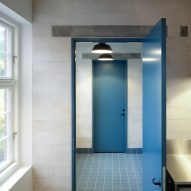 The studio headed by architects Uffe Leth and Karsten Gori was tasked with transforming the chapel into a facility called the Elephant House, which is operated by the Copenhagen Centre for Cancer and Health. 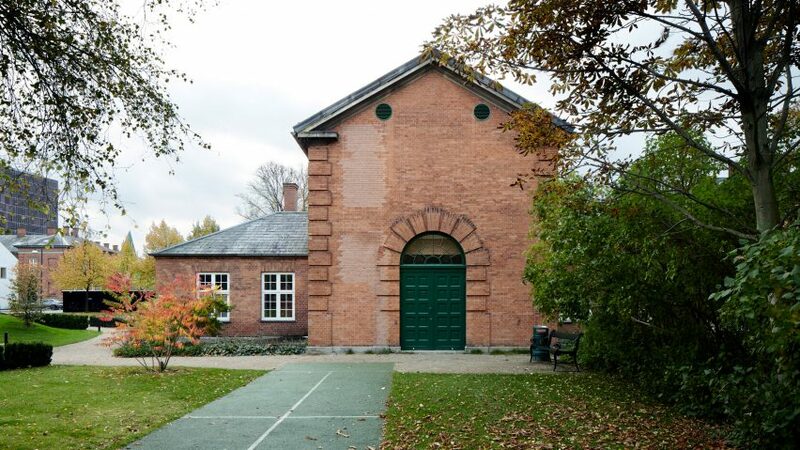 The chapel dates from the 1880s and is located alongside the centre's main building, which was designed by Nord Architects and completed in 2009. The Elephant House functions as an annex of the main facility. 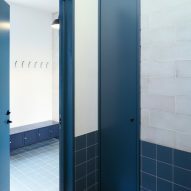 It provides spaces for rehabilitation activities and functions including fitness and training, mindfulness, yoga, discussion groups and events. 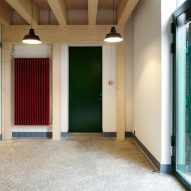 The focus of the architectural project was on updating the existing spaces to suit their new purposes, while retaining the character of the existing building. 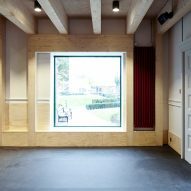 "The transformation of the former chapel seeks a new spatial design that carefully embraces the cancer patients with daylight, warmth, authentic materials and details, in celebration of the craftsmanship and original qualities of the historic building," said the architects. 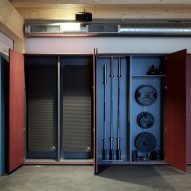 Following a detailed consultation with future users, staff and the centre's directors, the studio devised a strategy for reorganising the building's interior. 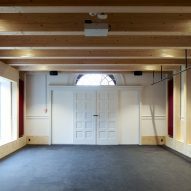 The chapel's nave is now the main training hall, which was updated by introducing a timber portal frame that incorporates bench seating between its pillars. The chancel was transformed into a workshop space lined with deep plywood shelves. 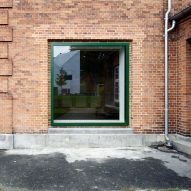 A glazed door opens from this space onto a garden to the rear of the building. Transepts to the east and west of the nave now contain kitchens, changing rooms, toilets and another workshop, all of which references the original building in their material palette. 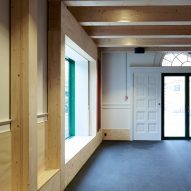 In particular, the hues of the chapel's decorative wooden ceilings are translated into fitted joinery and hardware including dark-red lacquered radiators, blue-painted doors and black handles. New glazed doors and a window looking out from the nave towards the adjacent building allow plenty of daylight to reach the interior. 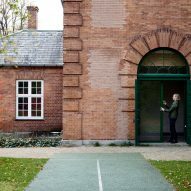 These elements are painted a traditional shade of green that contrasts with the red brick facades. 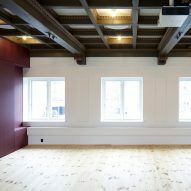 A wooden staircase ascends to a first floor containing a meeting room and a second training hall, where the original painted ceiling beams are visible. 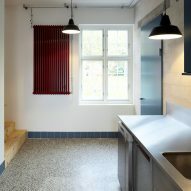 The use of chalkstone blocks for newly constructed walls and terrazzo for flooring in the kitchens and workshop areas encapsulates the sympathetic approach applied throughout the building's renovation. 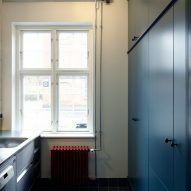 "We believe in the value of a thoughtful and careful transformation of the existing buildings," said Leth and Gori. "Straightforward and robust solutions, which are beautiful for many years to come." 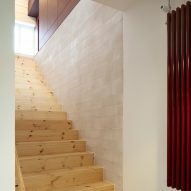 The pair formed their studio in 2007 and have previously worked on an extension to a bungalow comprising a cluster of asphalt-clad pods and a house featuring a low-maintenance interior lined with clay and plywood surfaces.